This one-woman show unleashes the anguish of an entire region. Not entirely a heartfelt elegy or an outraged revolution—although it has elements of both—Until the Flood is about the killing of Michael Brown in the St. Louis suburb of Ferguson, Mo., that helped incite a national movement. But it isn't what it sounds like. The Portland Center Stage production insists reform alone can't stop police shootings of unarmed black Americans. Instead, it confronts disquieting questions about masculinity that are guaranteed to leave audiences shaken and angry in the best way possible. Written and performed by Dael Orlandersmith and directed by Neel Keller, Until the Flood begins with a police audio recording that takes us back to Aug. 9, 2014, when Brown, an 18-year-old African American, was shot six times by Darren Wilson, a 28-year-old white police officer. 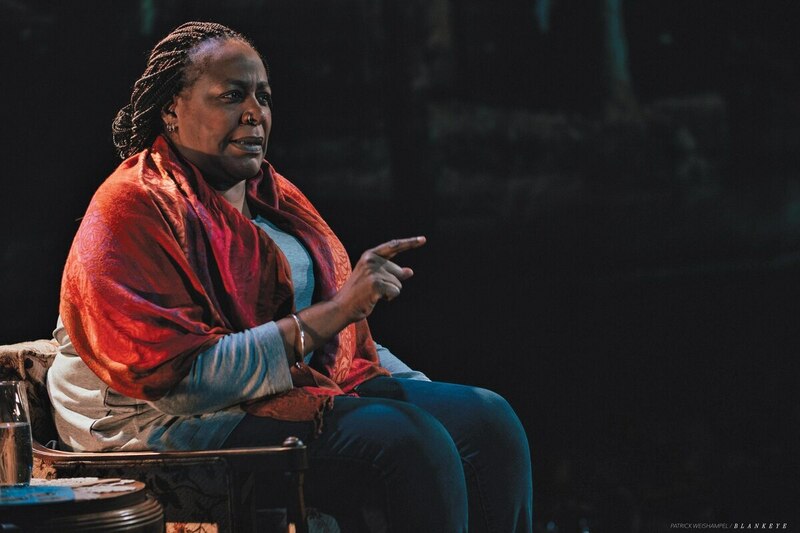 Rather than continuing along an expected narrative route—like checking in with the Brown and Wilson families or detailing the protests that convulsed the community in the wake of the shooting—the play presents a series of monologues based on interviews Orlandersmith conducted with area residents after Brown was killed. Each composite character features a distinct voice. These include black teenage boys terrified they could be next, a black minister who refuses to relinquish her faith in humanity, and white people who range from misguided to outright racist. Deciding to embody all of these disparate personalities was one of Orlandersmith's boldest moves. While her voice changes dramatically throughout the play, her physical transformations are equally impressive. It's astounding to watch her go from playing a teen who's so enraged by Brown's death that he knocks over a chair to playing an older barber who speaks while calmly clutching a broom, suggesting he's seen it all too many times before. Orlandersmith's work is matched by Takeshi Kata's scenic design, which features a memorial to Brown comprising teddy bears and signs adorned with cries of anguish like "STOP KILLING." Yet the most fascinating thing about Until the Flood is that it looks beyond the disputed details of what transpired between Brown and Wilson. The scope of the play comes into focus when Orlandersmith becomes Dougray, a white electrician who was tormented by his father. When Dougray describes how his father called him "queer" and burned one of his books, you feel a burst of empathy. But that feeling fades when Dougray proudly recounts hurling the same homophobic slur at his own son and ordering him to assault a group of black children. Dougray's story frames men who commit acts of violence as participants in a cruel cycle engraved in the male psyche. The play seems to argue, in their different ways, Wilson and Brown became victims of a society that conditions men to be "hard"—and that convictions and body cameras will mean nothing if Americans are not compelled to stop preaching the gospel of toxic masculinity. On the night I saw Until the Flood, the audience gave Orlandersmith a much-deserved standing ovation. Yet I can't help but wonder if uneasier currents coursed behind the applause. Were any men sweating as they questioned how they had fulfilled their role as a father or as a son? Did anyone recoil when characters expressed sympathy for Wilson? Did the two scenes that harshly criticize woke white people give any of the woke white people in the audience pause? Those questions can't be answered. All that is certain is, Until the Flood is the best kind of theatrical masterpiece—the kind that shatters a slew of assumptions and leaves the audience to pick up the pieces. SEE IT: Until the Flood runs at Portland Center Stage, 128 NW 11th Ave., pcs.org. 7:30 pm Tuesday-Wednesday, noon and 7:30 pm Thursday, 7:30 pm Friday, 2 and 7:30 pm Saturday-Sunday, through April 21. $25-$57.